However, in our present era of unchecked government issue of paper and electronic money, there is a vast confusion as to the nature of currency. Currency is now a measurement of value and a "promise" of value - rather than a store of value. Thus Currency is now a form of debt. This has led to the confused distinction that modern collectors hold between medallic issues and currency. Until our current era, medals have always been worth exactly their weight in precious metal - just like coins. Many Royal Proclamation medals were crafted by some of the greatest artists of their era. They often are sculpted in high relief, in tiny mintages, to mark interesting and important historical events. And they currently trade at a tiny fraction of similarly weighted common issue coins. After the death of chief engraver Thomas Wyon in 1817, Wellesly Pole offered famed Italian engraver Benedetto Pistrucci the post of Chief-engraver at the Royal Mint. However he never officially occupied the post due to controversy on the grounds of his foreign origin -and on account of his wildly tempermental character. A compromise was eventually agreed, in 1828, whereby William Wyon was made Chief-engraver and Pistrucci, "Chief-medallist." The two engravers competed fiercely for the most presigious medallic assignments. The coronation medals of Geroge IV, William IV and Victoria rank amongst the most exquisite numismatic portraits. William Wyon was son of Peter Wyon, the chief engraver of seals at the royal mint under George III and brother of Thomas Wyon. William held the post of chief engraver of the royal mint from 1824 until the time of his death in 1851. In 1851, William was succeded by his 24 year old son Leonard Charles Wyon, who was literally born at the mint. Joseph Shepard Wyon and Alfred Benjamin Wyon, sons of engraver of seals Benjamin Wyon (also brother of Thomas), continued the family engraving business through 1884. George IV gold Coronation Medal 1821, by Pistrucci, Eimer-1146 (signed B.P. on each side), 35 mm, plain edge, lovely example struck in extremely high relief, the cameo proof portrait untouched, with lovely gold color. The allegorical imagery depicts George IV seated and being crowned by the mythic Victory, while Britannia, Hibernia and Scotia bear witness; in the exergue, the date of coronation is given in Latin as July 19, 1821. The reverse legend, PROPRIO JAM JURE ANIMO PATERNO, "Now In His Own Right With His Father's Mind" serves to remind the king's subjects that he rules with divine right and continues the royal family line so long in place. The official coronation issue struck by the Royal Mint. A stunning lusterous piece - looks better than the grade. From a mintage of 1060 but very rare in this quality, and a masterpiece of medallic portraiture. From a mintage of 965. According to Carlisle: "this medal struck at the express command of Her Majesty ... only to be given by Her Majesty to those whom The Queen graciously condescends to honour." Official Gold Coronation Medal (31.17 ), London, 1838, by B. Pistrucci. Victoria. Rev. Victoria seated left, with lion behind her to right, receiving crown from Britannia, Scotia and Hibernia. Brown 1801. Eimer 1315. From a mintage of 1369 (but quite rare in mint state condition) of which 400 went to Peers, 540 to M.P.s, 50 to ambassadors etc and 295 the Privy Purse. Lovely high grade example, with full mint lustre. Another masterpiece by Pistrucci. Official Silver Coronation Medal (31.17 ), London, 1838, by B. Pistrucci. Victoria. Rev. Victoria seated left, with lion behind her to right, receiving crown from Britannia, Scotia and Hibernia. Brown 1801. Eimer 1315. Spectacular multihued example, only 1172 minted - so actually rarer than the gold example, and especially hard to find high grade, as the silver medals were tossed to officials (judges, politicians, officers etc) who lined the front rows of the coronation procession. The Morning Post reported that: "ribboned military officers and aldermen of the city of London were seen sprawled together and wrestling like schoolboys" at the general distribution of the coronation medals. 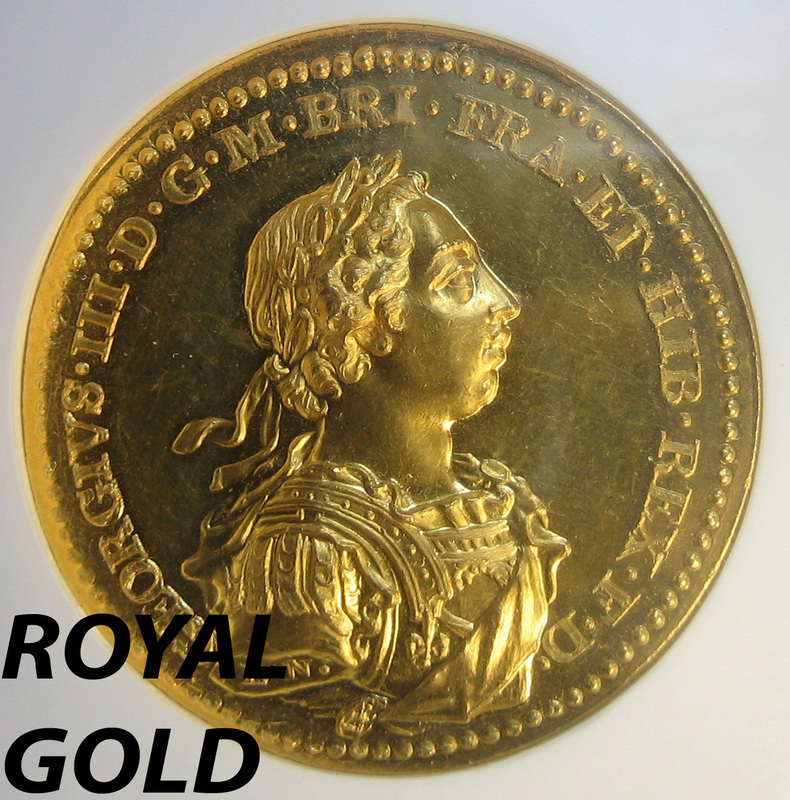 1870 Large Gold Reward Medal for Valor by W. Wyon, (58.8 gms) Obv Young Head bust VICTORIA D.G. BRITT REG F. D. Rev: around: PRESENTED BY HER MAJESTY THE QUEEN. within: recipient and ship named Percy Marner, HMS Worcester, and dated 1870. Several types of special reward medals were minted under Victoria. There are the "Cudi jussit" or "minted by decree" medals for special service, and then there were those presented for valor, some of which bear the inscription: "from the British government." This is the only recorded example inscribed as "presented by her majesty the Queen." This is not the usual sea gallantry medal which is featured below, and as such probably designed and awarded uniquely for this occassion. Of the highest rarity. Probably UNIQUE and in beautiful prooflike condition. The design of this extremely rare gold Victorian medal was commissioned to William Wyon in 1841 but not awarded until 1855, and then only in cases of extreme danger to the life of the rescuer. Less than 30 specimens have been awarded in gold. Gold examples were presented to members of the Royal Household and their personal guests. They were minted with the loop so that they could be worn at the ceremony - as many were, so finding one in this high grade is very rare. Silver Specimen Golden Jubilee Medal ND (1887), The Official Royal Mint Golden Jubilee issue 77mm. 217.5 grams By Boehnm & Leighton. Crowned and veiled bust of Victoria to the left, her name and titles around; Reverse: "IN COMMEMORATION" and two cherubs holding intertwined wreaths above personification of Empire enthroned. Three figures to her right, two to her left, and two reclining at her feet. In exergue, 5 small shields inscribed "ASIA, AMERICA, EUROPE, AUSTRALASIA and AFRICA". With flashy proof-like surfaces and frosted cameo devices. Lovely old cabinet tone displaying medium grey and heater purple throughout with attractive iridescent hues that pop out when tilted in the light. Difficult to find in Proof grade. 3750 were ordered from the mint, but it is unclear how many were actually produced. Mint State examples have become quite scarce. A very attractive piece with full mint bloom..
Gold Award Medal 51 mm., 5 mohur (58.17 grams.) Unsigned - By Wyon Calcutta mint. Only 38 gold medals were issued. Royal Society of Arts Gold Albert Medal 56,55 mm; (111.18 grams) engraved by LC Wyon. For "distinguished merit in promoting Arts, Manufacture and Commerce" Awarded in 1924 to Edward Prince of Wales, (later King Edward VIII). Obv: Albert Prince consort left, and Rev: personifications of Art, manufacture and Industry. Edge engraved: AWARDED TO H. R. H. EDWARD, PRINCE OF WALES, K. G. IN RECOGNITION OF SERVICES RENDERED TO ARTS, MANUFACTURES AND COMMERCE, / AS PRESIDENT OF THE BRITISH EXHIBITION AND BY HIS VISITS TO THE DOMINIONS AND INDIA. Past recipients include: Queen Victoria, Michael Faraday, Thomas Edison, Marie Curie, Franklin Roosevelt and Winston Churchil:. A very prestigious award. Extremely Rare, less than 50 awarded in fine gold. From the private collection of Edward Prince of Wales, later King Edward VIII and then Duke of Windsor. Auctioned off from his estate by Christie's June 2004. 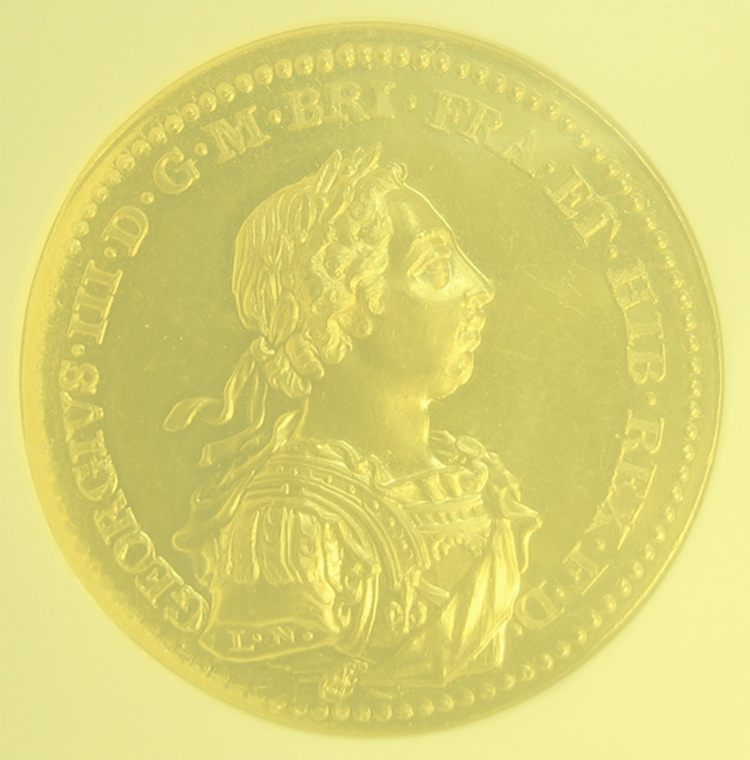 Official small gold medallion for the Coronation, 1902, by de Saulles, crowned bust of king r., rev. crowned bust of Queen Alexandra r., date on ribbon below, 31mm. (17.6 gm) (BHM.3737; Eimer 1871b), lustrous. King's Medal, G.V.R. (Edge named: 1922. Kenneth Harwood Crossley. ), reverse inscription within beaded circle: 'Duty to God and Man', around: 'In Honor of Arthur Duke of Wellington', reverse engraved to edge, 23 Karat gold, 44mm., 56.0g., Royal Mint issue. City of Glasgow, Coronation medal 1911, 45mm x 30mm (19.9g.) 15ct Gold and Enamel shaped oval Medal, conjoined busts left, thistles below, rev City Arms detailed in enamel, "let Glasgow flourish",suspension loop and ring, maker M&A. Inscribed to: Coun J. Muir, ( Lord Provost of Glasgow) Very Rare. A rare and attractive proof coronation medal. CHILE - ARGENTINA GOLD PEACE MEDAL 1902-3 of 4 escudos (14.8 GRAMS) .900 GOLD Chile's coat of arms/Two representations of Peace with shields bearing Chilean Star and Argentinian cap of freedom "La Paz lo Vence Todo" Signed by the artist M. H.
Excessively Rare: from a mintage of 3 pieces struck in gold. Of the finest artistic quality in high relief. ITALY, Papale (prigioniero del Vaticano). Leo XIII. 1878-1903. AV Holy Year Medal 1883 (43mm, 53.48 g,). By Bianchi. Dated RY 8 (AD 1883, in Roman numerals). LEO · XIII · PONT · MAX · ANNO · VIII, bust left, wearing zucchetto, mozzetta, and pallium / * HISTORIA · FVGIENTIVM · TESTIS · TEMPORVM · VERITATIS · LVCEM · ADFERT · ERVITAE · POSTERITATI · MENDACIO · PROFLIGATO · REIECTO, winged figure of Historia standing facing, holding scroll; behind, Lux holding ball of flame; before, Veritas blowing trumpet; to lower right, Cherub resting arm on tablet inscribed HISTORIA/ LVX/ VERITAS; all in clouds. Rinaldi 79; Mazio supp. 799 (all references for silver). AV Holy Year Medal (43mm, 56.52 g, 12h). By Bianchi. Dually dated 1890 and RY 13 (in Roman numerals). LEO · XIII · PONT · MAX · ANNO · XIII, bust left, wearing zucchetto, mozzetta, and pallium / TE · VINDICE · DEVS · VINCVLA · CORRVANT · AD · LIBERTATEM/ APOSTOLICAE · POTESTATIS, St. Peter seated facing in chains on rock, with arms spread, holding key; in exergue, A · MDCCCXV ·. Rinaldi 84; Mazio supp. 818 (all references for silver). Extremely rare from a mintage of less than 20 gold specimens.